In this guide we are going to show you how to enter Windows 10 without entering password. Having your device password protected makes sense when it comes to mobile devices but people mostly use Windows 10 PC at homes where there is no risk of computer falling in wrong hands. So entering login details and password every time you start PC can get annoying. Therefore, if you want to get rid of or bypass login on Windows 10 desktop PCs to use Windows 10 without entering password then you can refer to the easy instructions in this post below. Of course you can choose to skip bypassing login step when starting Windows 10 PC for security or parental control reasons. But if its for your personal use then having to enter password whenever PC goes to sleep or restart can get irritating and time wasting step. 1 – Click on the search box on taskbar and type netplwiz and click on netplwiz run command option from the search result. 2 – A new user accounts window will appear on the screen. 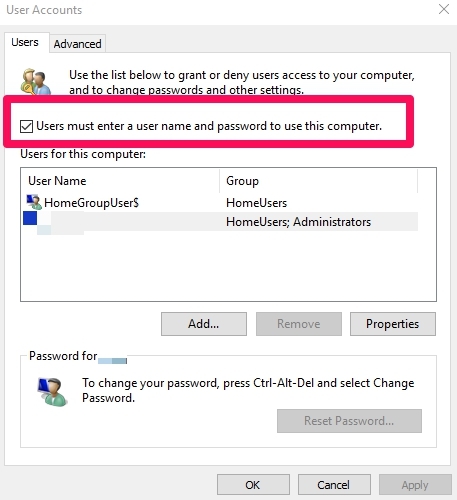 Uncheck users must enter a user name and password to use this computer option and click OK.
3 – Type in your username and password in remove Windows 10 password windows and confirm password by retyping it. 4 – Click the OK button. Wait until changes are saved. 5 – All done. Now you can enter Windows 10 without entering password on PC desktops. We Hope this guide proved helpful in easing your Windows 10 login woes. Keep sending us your feedback and ask any question in case you are having problem with Windows 10 apps, programs or files. Download Windows 10 Media Player Latest version.